Includes 1x hose, 1x ARB air chuck, 1x ARB T-fitting and an assortment of additional fittings to suit various camping and sporting gear. Includes 19ft air hose & necessary fittings for tire inflation and camping gear. Few 4×4 accessories offer as many advantages to off-roaders as readily available on-board air. 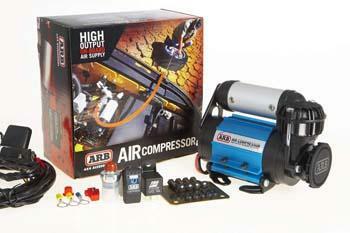 Considered by 4×4 owners around the world to be a staple accessory for off road travel, an ARB 4×4 Air Compressor provides an immediate source of compressed air anywhere a 12 or 24 volt power source is available. Tires perform best when they’re set at a pressure that’s appropriate for the terrain. While highway use calls for a relatively high pressure rate, lowering your air pressure will dramatically improve your 4×4’s traction in a range of off road environments. Compressed air allows you the freedom to adjust the tire inflation level of your truck to suit the conditions. An equally beneficial feature of on-board air is the ability to re-inflate tires that have been repaired – it’s not unusual to get several punctures in one day when traveling in extreme off-road conditions. In this environment, the value of owning an air compressor is priceless. When coupled with good quality tire repair equipment, an ARB air compressor provides the off road traveler with independence and peace of mind. ARB 4×4 Air Compressors are individually leak tested, current draw tested and flow tested under load at the factory before packaging and come with a comprehensive 2 year warranty. And ARB’s after-sales service is second to none with many of the compressor components readily available and easily sourced. Along with ARB Air Compressors, ARB also offers a range of tire accessories including tire deflators, tire inflators and tire repair kit. A perfect pairing with ARB Air Compressors.